Fashion's Night Out 2015 is held on Thursday September 10, and will be known this year as "Vogue Loves Regent Street". 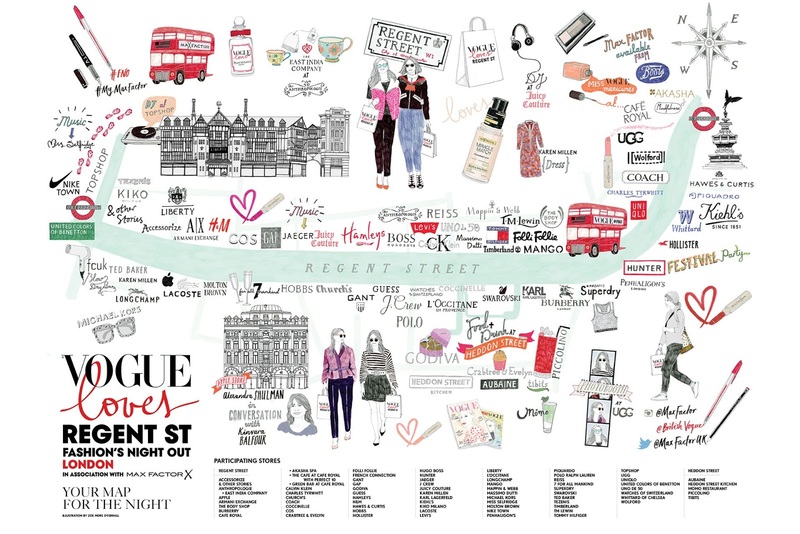 "We're delighted to be celebrating Fashion's Night Out for our seventh consecutive year, and as the centre of London's retail heartland it made perfect sense to focus our activity with Vogue Loves Regent Street," said editor Alexandra Shulman. "We hope thousands of shoppers will once again join us to celebrate the street's exciting mix of designer and high-street brands." Shop with an exclusive 30 per cent discount on shoes, plus enjoy a nail tutorial at & Other Stories. 256-258 Regent Street, London W1. Join the fun at 7 For All Mankind where you’re invited to an exclusive FNO champagne cocktail party and 10 per cent discount as they launch the new "Braided Jean". 225 Regent St, London W1. The lucky first 30 customers through Accessorize's doors at 6pm who spend over £40 will be treated to an exclusive goody bag. Don’t worry if you miss out – enjoy the newly launched make-up collection complete with demonstrations. 254 Regent Street, London W1. Don’t miss the chance to see BritishVogue editor-in chief Alexandra Shulman in conversation with Kinarva Balfour at the Apple store from 7.30pm-8.15pm – sign up for your ticket here at Apple.com. If you do miss out, then the talk will be available as a podcast following the main event at iTunes.com/applestore. 235 Regent Street, London W1. Head to Heddon Street where you will find matching martinis and macaroons at Aubaine to fuel your shopping for a special FNO price of £8.50. 4 Heddon Street, London W1. A special 30 per cent FNO discount will be available from Banana Republic when you sign up to their database. Spend £40 or more in store and enjoy a complimentary DryBy London manicure too. 224 Regent Street, London W1. Artistic Director Jason Wu’s capsule collection, BOSS Fundamentals, will be presented by Vogue’s Emily Sheffield and Diana Duah from 7pm-7.30pm. Enjoy drinks, a gift with purchase while special guest Amber Le Bon DJs. 184 Regent Street, London W1. Head on down to Boots at Piccadilly Circus where you can have your chance to take part in the #MyMaxFactor competition. When you visit the Boots premium beauty counters you can expect a thank you gift, on hand beauty advice, the latest product launches and demonstrations. What’s more, spend over £40 at one of these counters and be automatically entered into the raffle prize draw for your chance to win a beauty hamper full of top goodies. 302-306 Regent Street, London W1. Be welcomed in by mocktails at Burberry as you make your way to the beauty experience and watch two of Wendy Rowe’s make-up artists demonstrate contouring and strobing sessions from 6pm-9pm. Burberry, 121 Regent Street, London W1. Akasha Spa at Café Royal will be FNO’s most relaxing destination – it’s hosting two complimentary mindfulness workshops at 6.30pm and 7.30pm. These relaxing 30-minute sessions will be followed by a Q&A led by Akcelina Cvijetic – a cognitive, emotional, behavioural and performance coach – while guests will be treated to organic juices from Purifyne Cleanse and a special gift from Akasha. To attend, please RSVP saying which session you would prefer: VLRS@hotelcaferoyal.com. Reserve your place for a complimentary Miss Vogue manicure by Perfect 10 whilst sipping a Miss Vogue mocktail at Café Royal. Also available are a selection of light dishes and cocktails all served in the café. To make an appointment, please email vlrs@perfect10mobilebeauty.co.uk or call 0203 086 7833. Café Royal, 68 Regent Street, London W1. Discover fragrance and flavour at the Green Bar with eight special fragrances from Givenchy matched to a menu of cocktails (£8-£13). Be one of the first 50 Givenchy cocktail customers and receive a Givenchy lipstick too. Reservations are advised, please email restaurants@hotelcaferoyal.com or call 0207 406 3310. The Green Bar, Hotel Café Royal, 68 Regent Street, London W1. Enjoy refreshments, music and the new collection over at Camper this Fashion’s Night Out. 207-209 Regent Street, London W1. Pose for your Calvin Klein Polaroid as you enjoy macaroons served by male models and a 20 per cent discount (when you sign up to CK’s database). Also, take away an exclusive Calvin Klein Jeans tote bag with every purchase made this Fashion’s Night Out. 170 Regent Street, London W1. Spend over £100 to enjoy a special 10% discount at Charles Tyrwhitt. Church's artisan David Garfield will be in store demonstrating the craft of shoe making. 201 Regent Street, London W1. Clarks Shoes will be having a 20 per cent discount for all FNO shoppers. 101 Regent Street, London W1. Make your way to Coach where you’ll be invited show off your "FNO swagger" with bubbles and Nails Inc. manicures celebrating the new Swagger bag collection launching this September. 74-76 Regent Street, London W1. Shop Coccinelle’s new season "It" bag collection this Fashion’s Night Out and you’ll receive a special 20 per cent discount voucher for future purchases.69 Regent Street, London W1. Pick up one of only 300 #VogueLovestote collectors bag when you buy your one year’s subscription for Vogue for £19 at the Condé Nast Worldwide News shop from 6pm-9pm. Also, have your chance to win one of 10 “Vogue Loves” holdalls by posting and tagging your photo with #VogueLovesTote using @CNWorldwideNews Spend over £24 and receive a goodie bag full of exclusive FNO treats too. Vogue House, Hanover Square, London W1. Shop the new season with a 20 per cent discount at COS. 222 Regent Street, London W1. Express manicures, FNO discounts, cupcakes and fizz are all to be sampled at Crabtree & Evelyn. You can also "Tweet for Treats" using the #CrabtreeFNO and tagging @CrabtreeUK on Twitter and Instagram for the chance to win a luxury goody bag on the night.151 Regent Street, London W1. Enjoy Dropit's services for free exclusively for Fashion’s Night Out. Once you’ve shopped, hand over all your FNO purchases and track your deliveries straight to your front door via the app.Regent Street, London W1. Sit for your personalised illustration by fashion illustrator Michalis Christodoulou at Folli Follie this FNO which will be printed and transferred onto your very own tote bag. Shop the new collection of Swiss-made watches from the Romance collection and enjoy refreshments as well as exclusive products. 124 Regent Street, London W1. Join French Connection for a night all about you and the launch of their exclusive new Fashion Week Dress. Expect exclusive products, blow bar treats, refreshments and a DJ to get you in the spending mood. 249 - 251 Regent Street, London W1. Cocktails, cookies, a gift with purchase and more are all to be enjoyed at Furla this Fashion’s Night Out. 221 Regent Street, London W1. Join in the exclusive FNO launch of the #heyworld campaign at GAP as they partner with Ellen Degeneres’s new lifestyle brand, GapKids x ED. Step into their Regent Street window and interact with the GIF photo booth to create your own animated selfie using the fun props on hand. Plus, take advantage of the special 30 per cent discount across all denim too. 208 Regent Street, London W1. Trial Godiva's new collection of chocolates with the main attraction being the new Mousse Meringues launching exclusively. If this isn’t enough to tempt you, additionally you can enjoy 10 per cent discount with any purchase on Fashion’s Night Out. 141 Regent Street, London W1. Shopped until you’ve dropped? Head to Heddon Street Kitchen for a Takumi cocktail and a special Heddon St Kitchen platter (£15 per person) to refuel. 3-9 Heddon Street, London W1. Guess presents its Winter Garden this FNO – the store will be awash with real flowers, the perfect backdrop for a selfie in the #myguess photo booth where you’ll also receive your very own unique floral headband. Also enjoy cupcakes from Crumbs and Dollies, a prosecco reception and music. 160-168 Regent Street, London W1. Try on the latest studio autumn/winter 2015 collection with advice from H&M's style advisors. Also on offer, be sure to bag a spot at the nail and braid bar, listen to the live DJ and take away your very own fashion illustration. 234 Regent Street, 261-271 Regent Street, London W1. There will be plenty of treats for FNO’s youngest – or young at heart – shoppers at Hamleys. Prizes, live performances, discounts, necklace personalisation, glitter tattoos and hair braiding will all take place in store. 188-196 Regent Street, London W1. Hawes & Curtis is taking inspiration from The Man from U.N.C.L.E. this FNO – see the autumn collection, inspired by the film’s Sixties wardrobe, plus shop with a 25 per cent discount on the night.59 Regent Street, London W1. Illustrator Sarah Smart will be at Hobbs with her pen at the ready to sketch FNO shoppers whilst you enjoy the 20 per cent discount and be in with a chance to win an outfit up to the value of £250.217-219 Regent Street, London W1. Take advantage of the special 15 per cent FNO discount*, pop-up braid bar and styling tips from blogger host Freddy Cousin-Brown on the new season collection at Hollister. Fashion bloggers Emily Cocklin, Carrie Harwood and Chloe Helen Miles will all be there too distributing fashion advice and enjoying the Vita Coco water on hand. *Excluding gift cards 83-97 Regent Street, London W1. There’s an official Summer Closing party taking place at Hunter this FNO. Plus, one lucky shopper will win a VIP festival experience for 2016. 83-85 Regent Street, London W1. It’s all about customisation at J. Crew this FNO. Custom Swarovski crystals and fun appliqué will be on offer so you can go home with a truly unique piece.165 Regent Street, London W1. Join the Jaeger party where you can enjoy a glass of bubbles whilst you shop the new-season collection. Remember to share your photo captured in the campaign frame to be in with the chance of winning a £500 shopping spree. 200 Regent Street, London W1. Male models will be sashaying down Regent Street inviting you to the new Jo Malone Regent St boutique (opening in October) with bespoke invitations and chocolates. Regent Street, London W1. Head to Juicy Couture where there will be a 20 per cent discount, cocktails, as well as a fashion illustrator. Also, exclusively for FNO, purchase any tracksuit and have it monogrammed in-store and remember to take a snap in the Juicy Couture GIF photo booth too. 198 Regent Street, London W1. From 6pm-7pm Karen Millen will be hosting an exclusive RSVP hour in-store where you can preview the exclusively launched FNO pieces (turn up by 6.30pm and you’ll be welcomed). There will be an informal Q&A with Voguecontributing fashion editor Bay Garnett and Karen Millen’s creative director Gemma Metheringham at 6.30pm to introduce the new collection after which you can shop until 9pm. What’s more, spend over £200 and receive a special goody bag as you sip on refreshments from the White Lyan. RSVP is advised, please do so at: Karenmillen.com. 247 Regent Street, London W1. Break open your Karl Lagerfeld fortune cookie for the chance to win a gift in store as you enjoy mini bottles of prosecco, listen to the DJ and shop the new season. 145-147 Regent Street, London W1. Complimentary samples, skin and beauty consultations can all be found at Kiehl's. Plus don’t miss out on the photo booth fun and prosecco. 71 Regent Street, London W1. 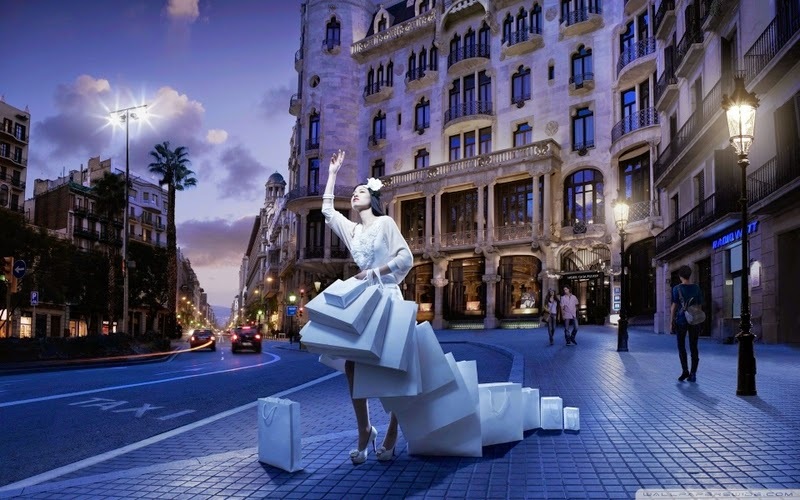 Shop your favourite beauty products from Kiko Milano with a special 20 per cent discount for one night only. 262-264 Regent Street, London W1. In store drinks, canapés, discounts and complimentary monogramming* are all at Kipling this Fashion’s Night Out. *On selected styles 205 Regent Street, London W1. Enjoy an express beauty treatment at L'Occitane, plus test out the personalised fragrance match making service and enjoy macaroons and champagne. In celebration of Fashion’s Night Out receive* a mini Neroli and Orchid Eau de Toilette and a Shea Butter Light Face Cream when you arrive armed with your September issue of Vogue or your illustrated map. *Whilst stocks last. 149 Regent Street, London W1. Enjoy nibbles, music and a Lacoste live installation this FNO. 231-233 Regent Street, London W1. Levi's has all your denim queries sorted with a 25 per cent discount in store to celebrate FNO. 174-176 Regent Street, London W1. Join Vogue’s Lucinda Chambers as she styles the latest Nikes and for the first 30 customers who purchase a pair they will receive exclusive Nike Dubraes. There will also be the chance to have your new Nike laces tie dyed at the pop-up station, visit the juice bar and photobooth, and for the first 50 people who Tweet or Instagram and tag #VogueLovesLiberty photo they will receive a bespoke Wild At Heart Liberty corsage. Plus, don't miss out on Eliza Doolitte DJ'ing too. 208-222 Regent Street, London W1. Little Social has created an Aperol Spritz menu especially for FNO, with three different versions to sample. 5 Pollen Street, Mayfair, London W1. DJ Jonjo Jury will be along at Longchamp as you shop the autumn/winter 2015 collection, take some memorable shots in the photobooth and make use of the Le Pliage personalisation service to customise your new Longchamp. 229 Regent Street, London W1. You’ll be treated to an exclusive 20 per cent FNO discount at Mango this year.106-112 Regent Street, London W1. Celebrating Fashion’s Night Out as well as its 240th anniversary, Mappin & Webb is running a competition for three lucky people to win one of their beautiful sterling silver Wildfell pendants from the new collection. 132 Regent Street, London W1. Shop Massimo Dutti’s new collection, and receive a gift with purchase this FNO. 156 Regent Street, London W1. Keep a look out for one of the fifty MaxFactor make-up artists who will be positioned along Regent Street applying touch ups. Then, be directed along to Boots at Piccadilly Circus and choose one of the latest trends for your complete makeover. Remember to show us your new look on Instagram and Twitter using the hashtag #MyMaxFactor to be in with the chance of winning a gorgeous MaxFactor goody bag as well as being featured on the Miss Vogue beauty page. Regent Street, London W1. Play your chance in the sweepstake and get in the mood to shop the latest collection at Michael Kors, where there will be a DJ and refreshments all night – what’s more, spend over £250 and you’ll receive a special gift with purchase. 223 Regent Street, London W1. Celebrate Fashion’s Night Out 2015 at Miss Selfridge with an acoustic performance from Laurel at 6.30pm. Prior to the event, be in with a chance of winning a style session for you and two friends hosted by one of the Miss Vogueteam in the personal shopping suite. 36-38 Great Castle Street, Oxford Circus, London W1. An evening of shopping complete with luxurious goody bags and refreshments can be found at Molton Brown. 227 Regent Street, London W1. Dine at Momo this Fashion’s Night Out and enjoy a complimentary cocktail - quote "Vogue" when you make your dinner reservations in the restaurant or for the set mezze in the MoCafé. 25 Heddon Street, London W1. Join Rebecca Gentry, Nike's master trainer, for a Fashion’s Night Out 5km run at 6.30pm. Afterwards, refuel yourself with in-store catering and attend a talk on nutrition from Calgary Avansino at 7.30pm. Sign up for the run here. 236 Oxford Street, London W1. Stop by Penhaligon's for your exclusive fragrance profiling appointment and enjoy a glass of champagne as one of the fragrant experts will explore your tastes, memories and associations. Once you have discovered your perfect scent, enjoy the pop-up Bloom Gin bar and a special FNO 10 per cent discount card. The first 175 people will also receive a goody bag. Don’t go home without snapping a photo beside the big VogueLoves Penhaligon’s bottle too. 125 Regent Street, London W1. Piccolino is celebrating this FNO with 50 per cent off the delicious Blueberries and the Bees cocktail in the Cicchetti Bar. 21 Heddon Street, London W1 4BG. Stop by for cocktails and special FNO discounts at Piquardo. 67 Regent Street, London W1. Grab a bite to eat at Pollen Street Social with petits fours and the champagne cocktail, "Hugs and Kisses" for a special FNO price of £18.50 when you mention "Vogue Fashion’s Night Out". 8-10 Pollen Street, London W1. Join Reiss where every hour (6pm-9pm) there will be 15-minute presentations from Reiss’s senior personal shopper taking you from desk to dinner Date along with the help of Bobbi Brown and Bumble and Bumble. There’s also the opportunity to win your favourite Vogue Loves look by simply snapping a picture and sharing it on Twitter and Instagram tagging @Reiss with #VogueLoves. Plus, enjoy Vogue mini cupcakes from Molly Bakes, Chandon cocktails as well as a 10 per cent FNO discount. 172 Regent Street, London W1. Superdry is adding a healthy spin to this year’s FNO as it celebrates its new technical womenswear sports line. This will be showcased by fitness blogger Kim Hartwell from Tone What you Own in the in-store active area, who will share her top exercise tips and talk through this season's pieces. Enjoy a sneak peek of the next collection too. 103-113 Regent Street, London W1. Sparkle at Swarovski this Fashion’s Night Out with DJ Charli Avery, Essie manicures and a 20 per cent discount.137-139 Regent Street, London W1. With a live Instagram printing station, Twitter vending machine and cocktails by The Looking Glass Cocktail Club, pop by Ted Baker this FNO and shop some new seasonal pieces. 245 Regent Street, London W1. Collect a special FNO clutch bag when you shop at Tezenis this Fashion’s Night Out. 266-270 Regent Street, London W1. Head-to-toe beauty prep will be on offer from the team at The Body Shop with hand massages and skin and make up consultations. 122 Regent Street, London W1. Quote the password "Fashion Fizz" and enjoy a complimentary glass of prosecco when you dine at tibits this Fashion’s Night Out. For five or more FNO shoppers please reserve via email info@tibits.co.uk 12-14 Heddon Street, London W1. Customise your Timberland boots this FNO, plus enjoy a DJ and refreshments in store. 144 Regent Street, London W1. Virgin Wines will be offering a wine tasting session for FNO shoppers at TM Lewin whilst you take advantage of the complimentary measuring service. 175 Regent Street, London W1. Walk down Regent Street and you will find Tommy Hilfiger foam hands inviting you to its all-American party - browse the autumn/winter 2015 collection, enjoy the fruit punch, take your position at the American football-themed photo booth and don’t leave without your "TEAM Hilfiger" foam hand. 138 Regent Street, London W1. Join Vogue contributing fashion editor and Topshop creative director Kate Phelan in store at 6.30pm where she will host a trend talk with Camila Morton and milliner Stephen Jones followed by a book signing. Afterwards be sure to shop Gigi Hadid’s seasonal edit from the main collection which will be launching on Fashion’s Night Out. What’s more, spend over £50 and you can refresh your look at Topshop’s beauty pit stop as you enjoy POPS champagne popsicles. Spaces are limited for the talk so please RSVP: PSRSVP@topshop.com 214 Oxford Street, Oxford Circus, London . Poppy Jamie will be on the DJ decks at UGG providing the entertainment while you get snap happy in the photo booth and sip on bespoke cocktails. Select your favourite song from Poppy’s playlist for the chance to win prizes from the in-store competition. What’s more, follow @UGGUK on Twitter for your chance to win the Vogue Style Edit picks from the autumn/winter 2015 range. 10 Glasshouse Street, London W1. Stop off at Uniqlo for an evening of health, fitness and nutrition this FNO. Enjoy organic, sustainable catering from the Hardihood sisters and Savse drinks. Be sure to arrive for 7pm for a panel discussion on health and wellbeing with Madeline Shaw, Rens Kroes and Vogue’sdeputy beauty and health editor Lauren Murdoch-Smith. Be one of the first 50 to shop Uniqlo’s new autumn/winter 2015 Activewear range and receive a goody bag voucher as you take advantage of the braid bar and enjoy the Aveda hair fixes on offer. 84-86 Regent Street, London W1. The first 200 people who pop by theUnited Colors of Bennetton store will receive a special FNO gift. 253-259 Regent Street, London W1. Shop for jewellery and accessories with a special 10 per cent discount, enjoy Freixenet drinks, temporary tattoos and a gift with purchase at Unode50. 143 Regent Street, London W1. Visit Watches of Switzerland this Fashion’s Night Out and explore the airplane-motorcycle legend. For one FNO shopper who buys the Bell & Ross watch, there will be the chance to win and personalise your very own B-Rocket Harley Davidson helmet*. Between September 5th-28th 155 Regent Street, London W1. Pop by Whittard of Chelsea for tastings of the new collection accompanied with iced tea cocktails and a 15 per cent FNO discount. 65 Regent Street, London W1. Customise your hold ups with Swarovski crystals when you spend over £80 at Wolford. Also, if you take a photo of the store (or any Wolford product) using the #WolfordFNO and share it @WolfordPRgirl on Twitter, you will receive a pair of tights as you enjoy the canapés and drinks in store. 56 Regent Street, London W1.